Your Home Fire Safety Checklist | Crenshaw Lumber Co. Inc. Since October is Fire Safety Month, it seems like the appropriate time to go over what you can do in regards to fire safety in your home. According to the CDC, deaths from fires and burns are still the third leading cause of fatal home injuries. Of these deaths, 70% are due to smoke inhalation. In addition, two thirds of deaths from house fires occurred in homes that either did not have smoke alarms installed, or they were not working properly. According to the US Fire Administration, cooking is the leading cause of home fires and home injuries. Statistics based on the 2006 – 2010 averages show that unattended cooking was by far the leading contributing factor to home cooking fires. Cooking ranges accounted for the largest share of home cooking fire accidents (58%). Make sure you have a properly working smoke alarm. Batteries should be changed annually, and the entire unit should be replaced every 10 years. As a battery changing reminder, choose an important day such as a birthday or holiday. Additionally, you can set an email reminder on your phone’s calendar or an online calendar. Make sure you have a smoke alarm for every floor of the house (including the basement) and make sure at least one is directly outside of the sleeping area. Smoke alarms should be tested monthly and in front of the children so that they are familiar with the sound. A planned escape route should be discussed with everyone in the family. In addition, the escape route should be practiced at least monthly. Whether your home is of new construction or old, installing a home sprinkler system is always a good idea. Sprinklers can reduce property damage and injuries in your home. Another benefit of a home installed sprinkler system is the potential of reduced insurance costs. 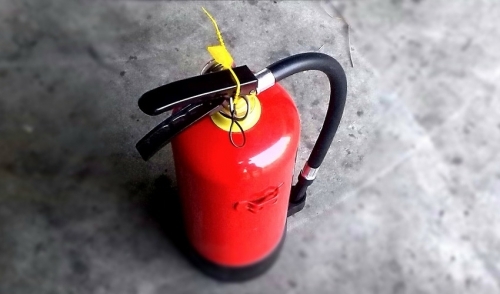 Every family member should be familiar with how to use a fire extinguisher. One should always be stored in an easily accessible place and checked regularly to ensure that it is still functioning properly. Inspect your range and oven. Make sure that your exhaust hood/fan is cleaned regularly. Grease and dust build up can create an unsafe situation. Promote safe cooking practices and make sure that everyone who uses the kitchen is aware of them. The US Fire Administration has many cooking related fire safety materials and videos available here. Inspect your dryer exhaust. Dryer lint is extremely flammable and can build up in the dryer exhaust vent pipe. Make sure that the pipe is not restricted and the outdoor vent flap opens properly when the dryer is operating. If you notice that the dryer is taking longer than normal per load, it may be an indication that there is build up in the vent pipe. If you have any questions regarding smoke alarms, home sprinkler systems, exhaust hoods, or dryer vents, stop in and ask our knowledgeable staff. We’ll be happy to help you determine what you need to keep your home running as efficiently and safely as possible.